One amazing satisfaction I get whenever i go downtown and spend some time in malls and parks is that I get to see so many cute babies! I am not a mom (yet) myself but I do adore babies and kids --- their adorable, angelic and innocent faces will never go unnoticed. A friend of mine who I went to school with for three months gave birth a year ago to a cute baby boy who they (she and her husband) named Frank. My friend and her husband were both so excited that they searched for a perfect stroller for their baby even months before little Frank was born. After looking from one page to another in the internet, they finally came up with a decision. According to them, they didn't have a difficult time purchasing a stroller for their son as they were lucky enough to find a great site which offers a huge selection of strollers that matches every parent's brand and style desires and of course every baby's needs. Six months after my friend have given birth to Frank, she has then decided to begin losing some weight. Since she loves to go out for a walk with her baby every morning, she thinks of converting the walk to a morning jog instead to help her shed off some extra pounds quicker. Her ever supportive husband has again looked through some jogging strollers at the same site to choose one for their much adored baby. Nowadays, my friend jogs for at least 30 minutes in the morning and another half an hour in the afternoon along with cute little Frank on his new stroller. The stroller's padded reclining seat makes Frank's morning and afternoon bonding times with his mom more comfortable. I will be attending a close friend's baby shower before finally spending a one month vacation in the Philippines. 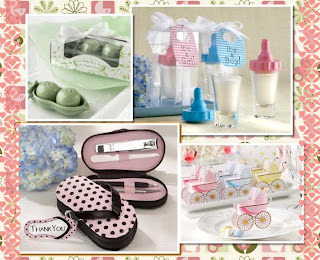 I still haven't come up with the final decision on which item to choose from the very cute lines of baby gifts as shown on the photo above. Well, I still have a week and a half to make up my mind. I just hope to find the one which will really make my friend happy!